Here are some of the best May highlights at Geilston Garden . The air in the walled garden is filled with the scent of yellow Rhododendron luteum, and as you pass under these your eyes will be assailed by the blazing colour of the heritage varieties of Japanese azaleas in full bloom. The main rhododendron glen in the woodland garden has a veritable plethora of stunning blossom. Continue along the Geilston burn towards the potting shed to admire the wonderful burnside planting of the purple-blue Iris sibirica border. And the icing on the cake - the entire woodland garden is carpeted by an understorey of native bluebells. What an amazing flowering season! In 30 years at Glenarn we have never seen it better and the cool weather is helping to keep the flowers looking pristine for much longer than usual. The big-leaved rhododendrons are still in flower in the middle of May – generally they would be over by the end of April. The huge trusses of cream to yellow flowers are waxy and can survive rain and blustery winds if they are sheltered. New treasures such as Rhododendron falconeri have started to flower this month and the whole family of R griffithianum with magnificent white scented flower trusses is just about to begin – this species is the parent of all the ‘Loderi’ hybrids, just unfurling their upright buds in shades of pink and white. The glen is lit up by the R triflorum family, masses of starry flowers in white, mauve, blue and all shades of purple so that wherever you look there is colour, including the carpets of petals underfoot from earlier blooms. The star of the show for me – at this moment – is R lindleyi whose creamy pink buds are just on the verge of opening and the expectation is huge! I know that the air will be scented – lily of the valley, perhaps – over the next 2 weeks by these beautiful lily-like trusses of flowers opening with a pink stripe or flush in heads of 6 to 10 flowers and slowly fading to pure white. If you come to Glenarn, you won’t miss them! This year the early magnolias were disappointing, too much cold for too long I think. But we are now being rewarded by the later ones - Magnolia kobus a huge starry flowered tree 40 feet tall and visible from the top of the Rock Garden, M denudata with crisp white candles and other smaller trees which provide surprise and interest as we walk round the garden. 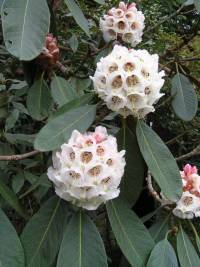 April and May are busy with visiting groups, some specialist like the Breton Rhododendron Society and some more local and generally horticultural. We enjoy explaining the history of the garden and its plants and taking the groups round pointing out the treasures. The French in particular this year were delighted by our unusual and historic rhododendrons grown from seed sent back from the Himalayas by many plant collectors last century. Work continues apace in the garden with repairs to paths and steps – a large group on a wet day can be quite destructive to paths! The vegetable garden is now almost full and the first early potatoes pushing up. Fruit is forming on the bushes and bedding plants being planted in pots for display round the house over the summer. The Rock garden is coming to life with trilliums crowding out a raised bed – I must lift and split the clumps as they go over this summer. Tall patches of camassias are just about to open. The unfurling foliage of the tree peonies is dramatic against the bright colours of dwarf rhododendrons. From the top path above the quarry, the view, while actually remaining the same, appears to change through the spring with first one distant rhododendron or magnolia catching your gaze and then another – amazing! And it’s the same through all the Glorious Gardens – some more advanced if they have protected sheltered spaces and others with more flowering still to come in more open or wooded ground. Do try to visit a few – and be surprised!